What Twitter Clients do Senators Use? 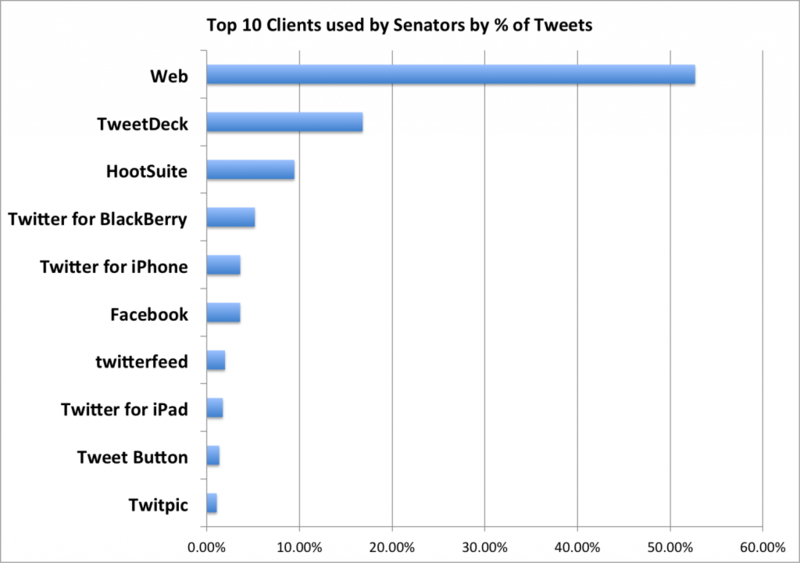 I was curious what clients our US Senators were using to manage their twitter communications: something sophisticated? An integrated package that allowed them to track engagement? The only software that counts as being reasonably sophisticated is Hootsuite, which is a web application that allows you to create, schedule, track, and analyze your tweets. 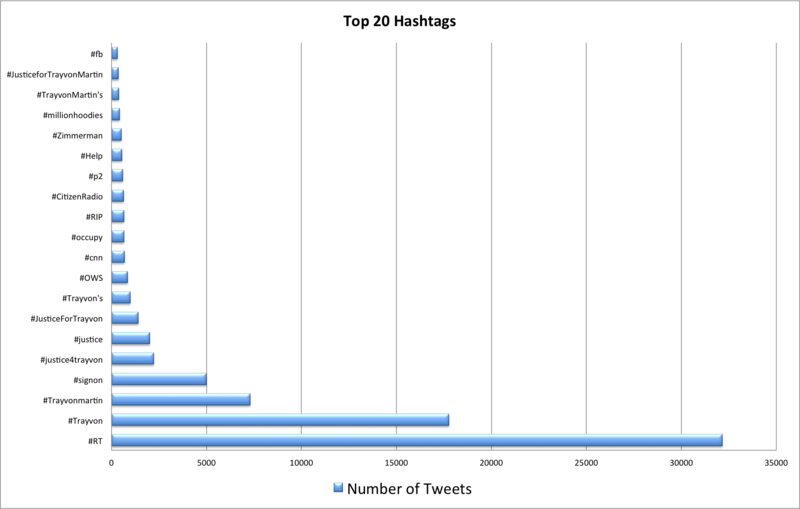 Less than 10% of the tweets came through Hootsuite, though, with 21 senators using HootSuite for at least some of their messages. Congratulation to the 21 members of the avant garde! I’m kind of surprised there isn’t some sort of best practices standard for senators to use for Twitter at this point. I can understand using a mobile client for in-the-moment tweeting — it’s great to capture spontaneous observations and (especially) photographs. But for back in the office (and often staffer driven) tweeting, using the web should only be a last resort. It gives you reports on your Twitter usage and engagement. You look more professional, and I won’t call you out on using the web. You don’t want to be a white-belt Twitter user forever. Did I mention it allows you to track your engagement? And it’s cheap? Sorry for pulling out the soap box! The boring stuff: For each of the Senators who have a twitter account (see here), I retrieved their most recent 200 tweets (For Senator Inhofe, that goes back to 2008!) and tallied up what client was used for each. So I created one. You can see it here or by clicking “Resources” in the menu above and picking the choice for US Senator Twitter Accounts. While most of the media attention is focused on the GOP Presidential Primary, we have a very important GOP primary in Florida for Senator coming up mid-august. And there’s three main candidates in the running: George LeMieux, Mike McCalister, and Connie Mack. 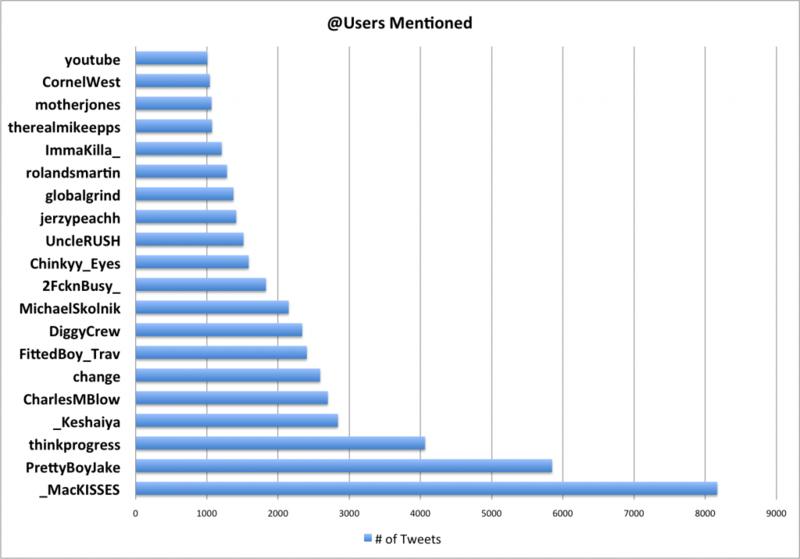 Let’s take a look at how they’re engaging with Twitter — and how Twitter is engaging back. LeMieux and Mack are more or less neck and neck, while McCalister has been much quieter. We can see that Connie Mack is in the lead, with George LeMieux having about two thirds as many, and Mike McCalister having only a little over one fifth the followers of Mack. Wow! 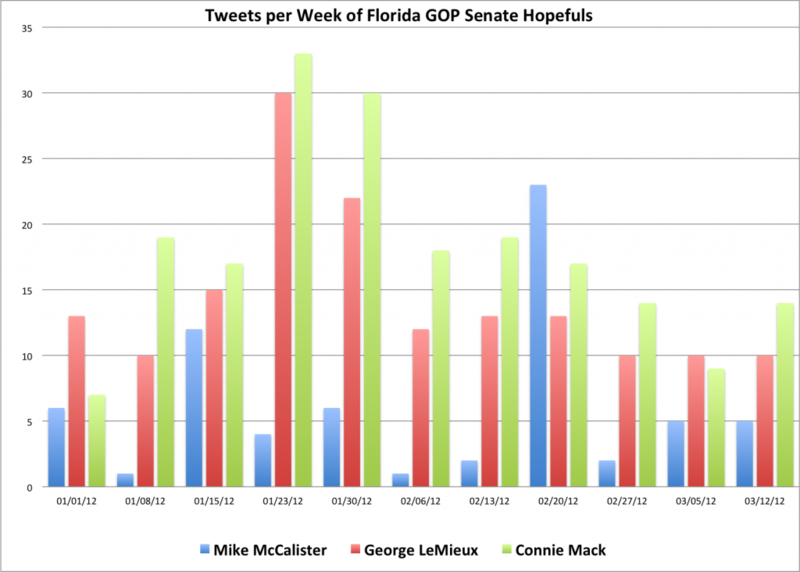 Connie Mack has a hugely larger engagement with voters on Twitter. He is pulling way ahead of the others. Yes, it’s still a long way until August 15th, but let’s not forget that Marco Rubio used Twitter to out flank Charlie Crist 2 years ago. Crist never engaged in social media effectively, and therefore didn’t see the forces that Rubio was massing there that eventually pushed Crist out of the party. Trayvon Martin’s shooting in central Florida has generated a great deal of anger and protest, with a huge protest rally taking place in Sanford, FL yesterday. And the protest has taken place on Twitter as well, with huge volumes of tweets being sent and resent. What’s interesting is the explosion of re-tweets towards the end of the day. This is like an avalanche picking up speed — the initial bolders dislodge other bolders, until the side of the mountain is slipping down to the valley. User PrettyBoyJake made one tweet, at 5:18 pm, which said “R.I.P. To The Young 17 Year Old Boy Trayvon Martin From Florida Who Was Shot & Killed By A Racist Neighborhood Watchman #RT To Show Respect” and got nearly 6000 retweets. At 9:13pm, user _MacKISSES tweeted “R.I.P. Trayvon retweet to show respect ! 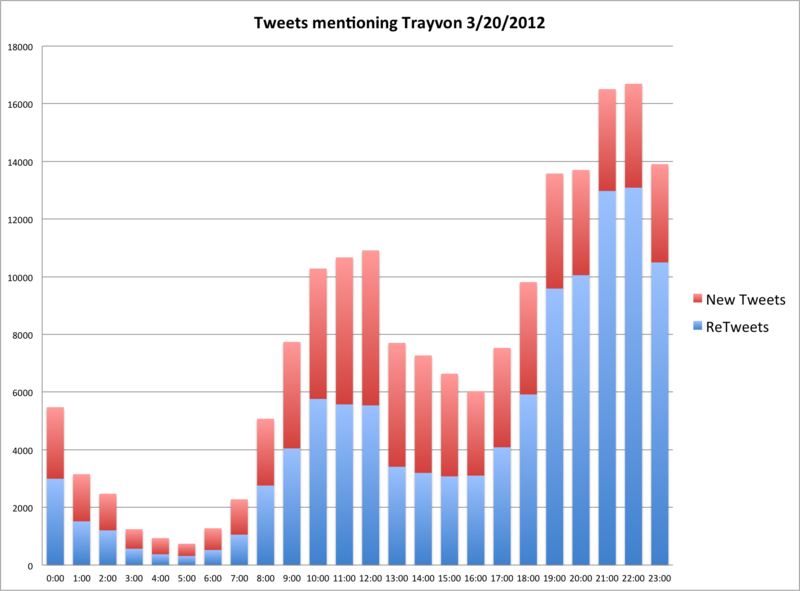 http://t.co/p9w4zJ7c” — and that tweet caused the spike we see during the 21:00 (9pm) and 22:00 (10pm) hours with over 8000 retweets. The right message at the right time can generate a huge response on twitter! I think the “#rt” hashtag is interesting — it’s asking people to retweet. It’s not surprising that “Trayvon” is at the top, FYI, as that was a search term used to identify the tweets — every tweet analyzed used that word. (Click on the chart to see a larger version). 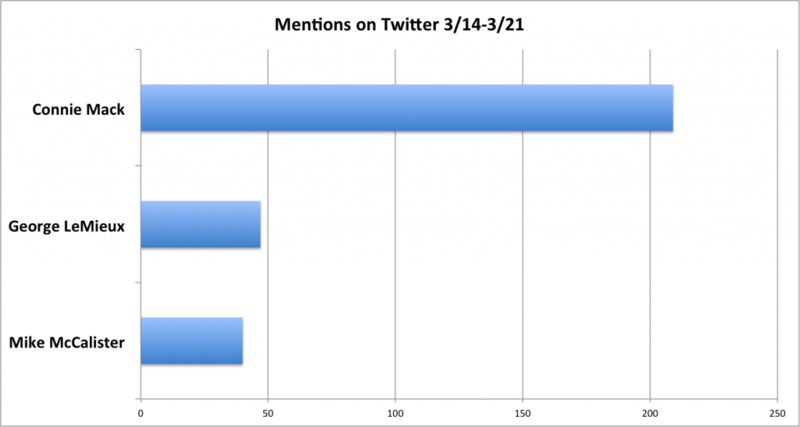 All told, I analyzed 181,622 tweets that had been sent yesterday, 3/20, between midnight and midnight, EDT. The volume is impressive, and the 61% or so that were retweets (I was fairly strict in defining what is a retweet) show that retweets are a powerful way of demonstrating support for a topic, somewhat akin to the “Like” button in Facebook or signing a petition at Change.org. USA Today comments on how social media has brought national attention to the Trayvon Martin case, saying that without Facebook, Twitter, and Change.org the case would have never gained national attention.